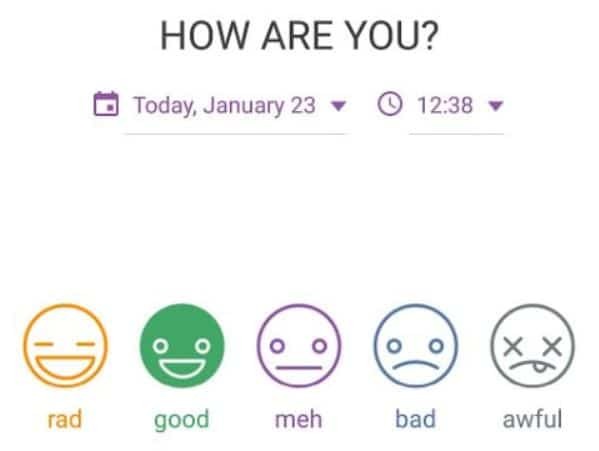 Tracking your mood can be eye-opening to a lot of people. No matter if you're depressed, happy or not really worried about your happiness, there is a lot you can learn from simply tracking your happiness. It's what this entire website is about: to get to know ourselves in order to steer our lives in the best direction possible. That's why I'm reviewing Daylio today. 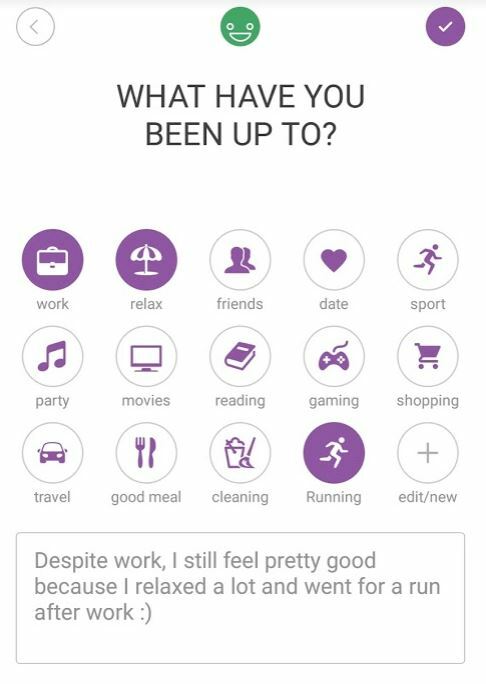 Daylio is a mood tracking app available for Android and Apple which has gained a lot of popularity the last year. It's time to have a closer look at it, and especially to consider how you could benefit from using it! What is Daylio and what does it do? How can Daylio help you become happier? What are the pros of Daylio? What could Daylio do better? 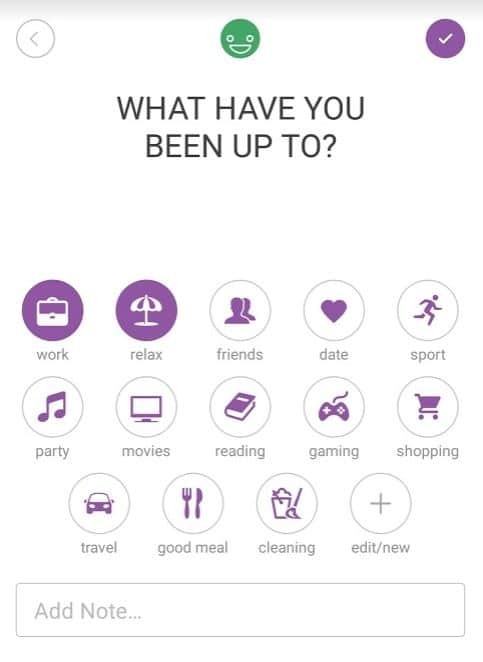 Daylio is a mood tracker app, which focuses on a minimalistic approach. It means that the core principle of Daylio is based on 5 basic moods. There's a big chance you have seen these before. 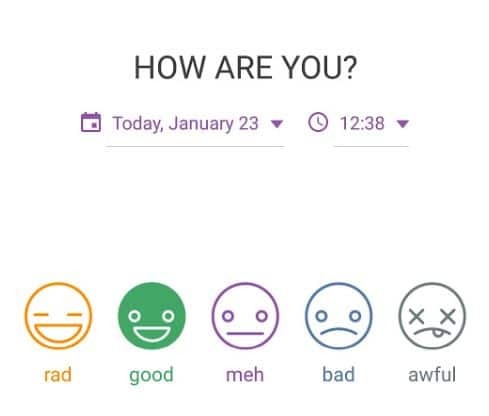 The app asks you to rate your mood based on these 5 emojis, going from Rad, Good, Meh, Bad and Awful. By default, it'll ask you every day at a set time, but you can customize this and enter your mood as much as you like! This is mood tracking at its finest. I really like the minimalistic approach that the app has, and it doesn't require you to think too much about how you're feeling. You only have to select the emoji you most relate to at the moment, and that's it. No difficult questionnaires, quizzes or measurements required! The principle goal of measuring your mood is to see what influences your life the most. By knowing what has the most influence on our happiness, we can focus our attention on improving that aspect of our lives. Do you hate your work and is your mood constantly affected by it? Then Daylio will quickly show you just how much exactly, so you'll be able to steer your life in the best direction possible. This is why Daylio also wants to know what you've been up to. Daylio wants you to add "labels" to your mood. Let's go back to our example, if you hate your work and you're unhappy because of it, then you can select your work as a "label" and Daylio will store that data safely next to your mood. This is a fantastic function since this easily allows you to add an extra dimension to your mood data! Even better, Daylio allows you to add your own "labels" in addition to the default labels. 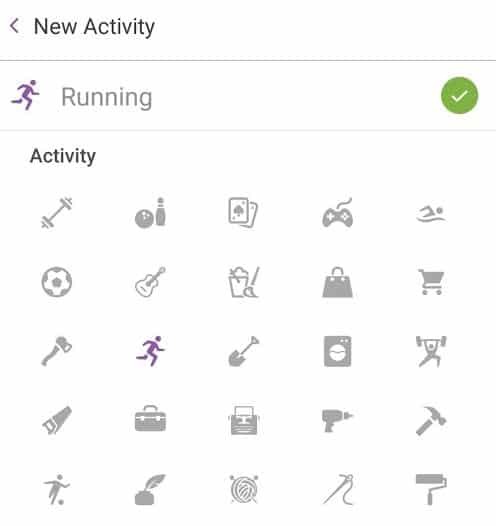 So if you want to see how often you've been going out for a run, you can easily add this as an additional label. It works extremely well and is super easy. One more function that I really like about Daylio is that you can include a journal section each time you track your mood. So whenever you feel like your mood and labels don't tell the complete story, then you can easily add a couple of notes there as well. These 3 functions are the core principles of Daylio, and they've done a great job at making data input as easy as possible. Now, the rest is up to you: you need to input your mood in Daylio on a constant basis. That's how you can begin to learn from this data, and as we all know: that's when the fun begins! 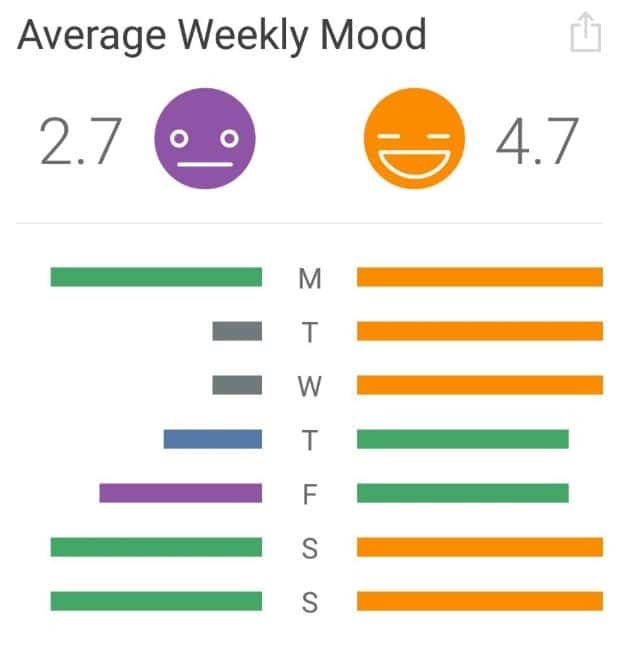 Daylio has some basic visualization functions that allow you to see the trends in your mood. They are basic graphs that show you how you've rated your mood over time, but also which days are likely the best days and what "labels" occur most often. Here are two examples that I found on Reddit. The first picture shows the difference in mood between the last week of University and the first week on vacation. 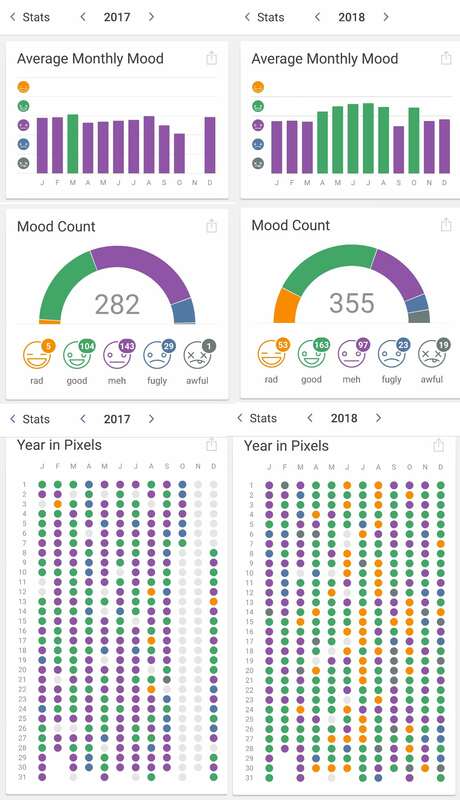 The second picture shows an example of how Daylio visualizes certain milestones, like tracking all 5 moods in a single week. I probably don't need to tell you that these visualizations only become more interesting over time, as you continue to track your mood. Here's a great example that I saw on Reddit recently. 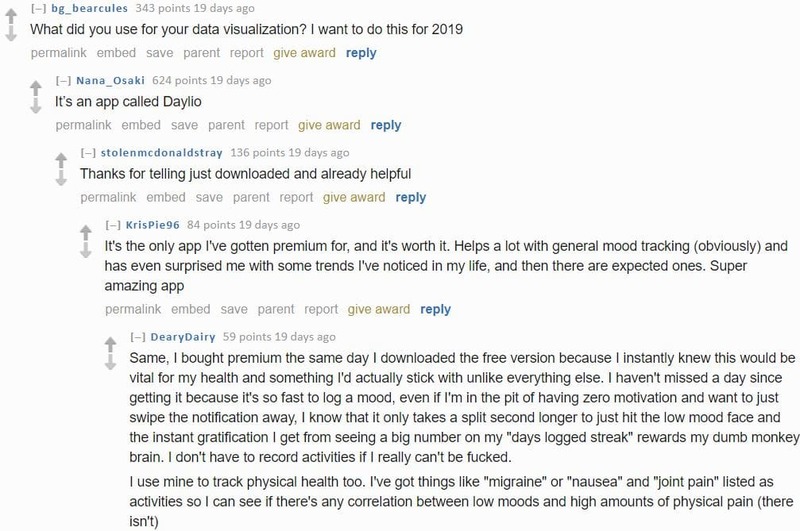 A user shared 2 years of tracked mood data from their Daylio dashboard, and it received a lot of great replies. This kind of data visualization is awesome because it's simple yet very informative. The user who posted this allowed me to share it on this review as an example. Daylio really does a good job at increasing self-awareness, as it nudges you to really think and reflect on your day for a minute. That's what people love about it, and rightfully so. I hosted a post from Sanjay a while ago, in which he shared what he had learned from tracking his happiness. He started tracking his happiness with Daylio during a difficult time in his life, but he was able to turn it around! Here's an example of one of his unhappiest months. I'll leave a paragraph from Sanjay's post here, to show you how much he profited from tracking his happiness. Around the time I started tracking my happiness, I was trapped in a toxic relationship. I didn't realise it at the time though, so I kept trying my best to fix things, not realising that my girlfriend didn't want our relationship to improve. Looking back, there were many warning signs: The verbal abuse, the deception, irresponsibility and lack of mutual respect. I ignored many of these signs because I really wanted the relationship to work. During this time, I became extremely unhappy and my happiness data indicated that I was at an all time low. Even though it was clearly this relationship that was causing most of it, I couldn't bring myself to leave. Looking back on my journal from that period, it astounds me that I allowed myself to stay in that situation for so long. 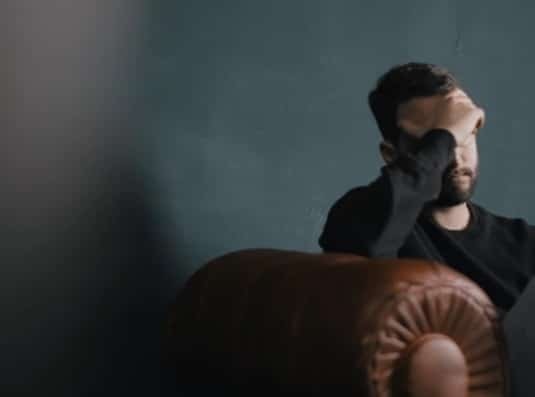 I could see from the way I was writing about my experiences at the time that I was completely blind to the real issues in my life and wasn't thinking rationally. 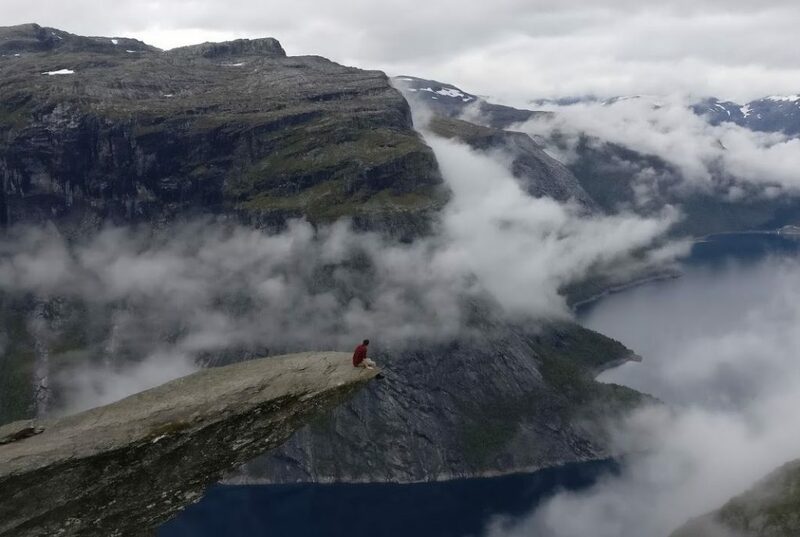 The ability to look back and review my own thoughts provides a unique insight into the workings of my own mind at a certain point in time, and enables me to see how much I've changed since then. It's almost freaky, how different I was back then. It's clear to me how a mood tracker app like Daylio can help you realize how your life needs a change. I'm hoping that you can see this too. You might not know you're in a dire situation untill the data is right in front of you. 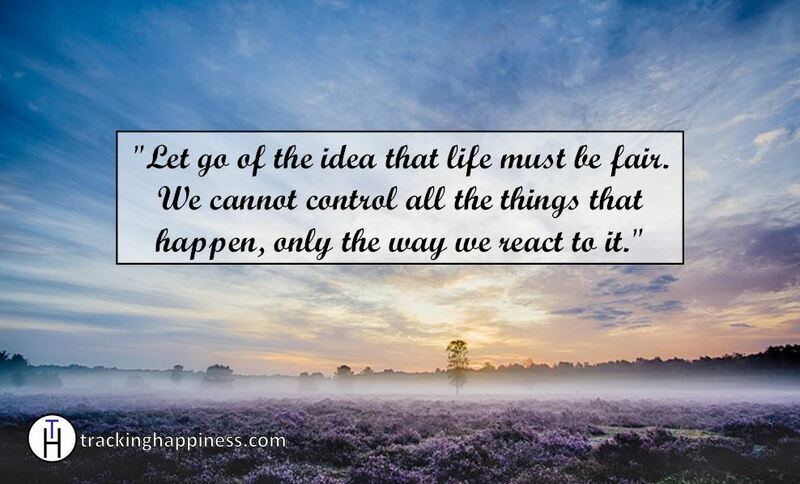 Seeing how unhappy you are in certain scenarios might help you decide to actively steer your life in a better direction. Knowing is half the battle. Throughout my usage of the app, I never felt lost in the functions of the app. Everything is extremely intuitive and works just as you would expect. This is something that is extremely important, as you're going to be using the app at least every day. Tracking your mood should be as easy as possible, and the creators of Daylio have really delivered here. The design is what you expect it to be: clean and beautifully minimalistic. The mood rating scale is simple: you don't have to think too long about rating your mood. You just pick the emoji that most resembles your current state of mind. It literally doesn't get any easier than this. The visualizations are like its design: clean and minimalistic. This allows you to quickly view your progress after tracking your mood. Daylio also congratulates you upon reaching certain milestones (100 days tracked for example) which is a very nice touch. Having tracked my happiness for over 5 years, I can think of a number of things that I think would further improve Daylio. However, this is my personal opinion, so these cons might not bother you at all! There are some people who have created further analysis methods, but you won't be able to find detailed correlations between your mood and your labels (what you've been up to). To me, this is one of the most important benefits of tracking your mood, so it's a shame that Daylio doesn't have this functionality. When I want to track my mood, I definitely want to be able to see what factors affect my mood the most. I'm pretty sure I'm not alone here! No good export functionality, so you won't be able to dive deep into your data without having to do some serious DIY'ing. Back when I first started to track my happiness - more than 5 years ago by now - I scoured the market for an app like this. Daylio didn't exist yet at that point, so I decided to buy myself a real journal to track my happiness in there. Two years later, when I wanted to track my happiness digitally, there was still nothing on the market that did what I wanted. There still isn't. I have developed my own tracking tool over this time, in which I can track everything I want. The best thing about this method is that I can dive into the data as much as I want. This data has been the source of my happiness essays. Even though I think it is a fantastic app, I could have not done this with Daylio. Daylio is probably the best mood tracking app that's currently out there. There are some things it could do better, but there are many more things that it does extremely well. 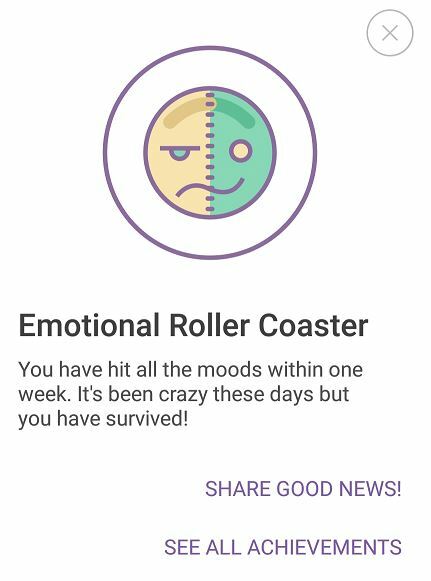 The app makes it super easy for you to track your mood, it will only cost you a minute per day. You can try the free version of the app to see if it works for you!